But, then again when it’s this much fun how can you not want to have a little go at it? In this edit Jean-Baptiste Chandelier makes flying look effortless, smoothly gliding across anything with ease and keeping it smooth. It’s surely an inspiration for anybody that has ever considered trying this sport, which has been growing in popularity in the past few years as the equipment and potential has also been advancing. So, maybe next spring should be time to sign-up for some introductory lessons and start your own path to flying. Jean-Baptiste Chandelier is a highly skilled paraglider pilot and aerial innovator at the forefront of acrobatic flying, with over 10 years experience as a professional pilot. The creator of exceptional viral videos, his skills in proximity and wagga flying have been featured in several original advertising campaigns. 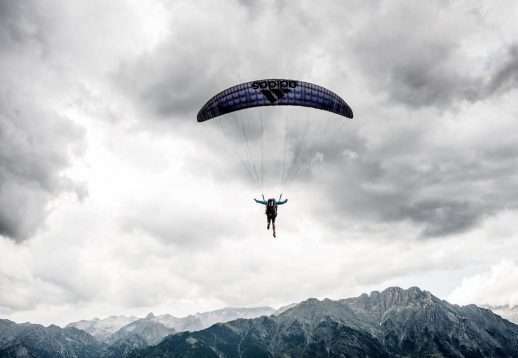 Based in Embrun, France, Jean-Baptiste is proud to be partnered by Adidas Outdoor and Dudek Paragliders. It’s inspiring to watch and I always love when talented people make difficult things seem easy. They make you want to get out and do it too. If you’re inspired, stick around and check out some of our great adventure holidays, outdoor courses and expeditions. Whether you’re looking for ski holidays, surf trips, hiking trips, climbing tours, bike tours, polar or mixed activity holidays we have something that will help get you inspired too. If you don’t find what you’re looking for, or if you’d like some help and suggestions, just get in touch, we’ll be thrilled to help you.